Every year millions, if not billions of people make New Year’s Resolutions to eat right, get fit & lose weight – and most have abandoned them by March 31st at the latest. Here are the top 5 reasons for their failure and how YOU can avoid making these same mistakes year after year. Before you even set your fitness goals or weight loss goals for the new year, you first need to understand how you got into the shape you’re currently in. Unless you have a chronic condition or have suffered a major accident, you’re not a victim of anything – and no one else caused you to be out of shape or overweight. It’s imperative that you understand it’s your personal habits that led you to your current state. You made choices all along the way, and the choices you made over and over became your default – your habits. Your habits led to your current lifestyle – what you eat, how much and how often you exercise, and what bodyweight and fat percentage you’re willing to carry around with you every day. That’s the bad news, so now here’s the good news: YOU created those habits, and YOU can change them starting right now, today! Changing your exercise habits or nutritional habits starts with small choices – and over time those choices add up. Plus, when repeated over and over they become your new habits. Yes, this means you need to put a little more thought into routine daily tasks. But you’re not satisfied with your current state of health, your fitness or your current bodyfat levels or you wouldn’t be making these New Year’s Resolutions. So put in that extra thought and make the choices that help you keep these promises to yourself! When it comes to working out you don’t take the time – you MAKE the time. One of the few universal values we all share is that we all have the same 168 hours per week, and we all get to choose what we do with those 168 hours. Think of people Like Donald Trump, Richard Branson, Tony Robbins, Louise L. Hay or Les Brown and all they accomplish in any given week – yet they only have the same number of hours that week as you do. The busiest and laziest people you know have 168 hours a week too. The only difference between them and you is priorities – you use your time in proportion to the importance you give each activity. So if getting in shape, being healthy and weight loss are sufficiently important to you you WILL make the time for sufficient exercise to accomplish your goal of getting back in shape and staying in shape. Don’t try to tell me you don’t have enough time – we all have the same amount of time, and you already know people in your situation who have time to hit the gym, go for a run or take exercise classes, don’t you? What you really mean is your current activities already fill your schedule, right? And that’s the biggest reason exercise resolutions get broken year after year – trying to fit 3 – 5 workouts a week into an already over-crowded schedule. It’s like trying to pour another cup of water into a full glass – it won’t go in, but instead will make a mess, right? And that’s what happens when people try to add in exercise time to a full schedule – it makes a mess of their week. So how do you solve this one? Simple. Decide what to take out of your schedule to make time to exercise. Look for the obvious time-hogs first: watching television, spending too much time on the Internet, playing computer games, hitting the bars and clubs, etc. Everyone I know spends time at at least one of those four, and I assume the same can be said about you, right? So now you have to decide where you’ll trim the time for 3 or more exercise sessions per week. Remember, the decisions need to be made based on your priorities – is your health more important to you than those reality shows, time on Facebook and Google+, beating the next level of WOW or knocking back a few drinks at the bar quite so often? For best results, don’t eliminate anything you truly love to do, or you’ll harbour resentment towards your workouts and your own subconscious will sabotage your workouts. Instead, cut out what you really don’t care about and if you need to make more time still then trim back the activities you enjoy just enough to free up the time you need. Taking just 20 minutes a day from each of 3 leisure pastimes gives you that hour a day, as does skipping a single TV show a day. You already have the time… Now just free up enough of it for your exercising – and decide in advance where the time’s coming from so there’s no conflict each week. Let’s look at a common pair of weight loss and fitness goals: losing 20 pounds of bodyfat next year and adding 20 pounds of muscle next year. 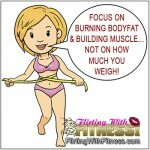 Either one can make a major change in your health and body image while boosting your self-confidence and energy levels. The biggest problem is far too many people suddenly jump into the gym and start lifting weights life a fiend to build muscle fast, or drastically cut their calorie intake thinking they need to drop all 20 pounds in the first month or two. If you did either of these last year, how did you measure up at the start of this year? If you’re like most people, you were even further from your goals this year than last. The issue here isn’t your goals – both are reasonably achievable. The issue is a sudden change in your diet and/or exercise routine. Why the rush? 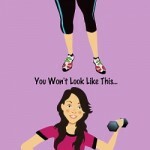 In most cases it took years to get to the shape you’re currently in, so don’t try to change it overnight! To lose 20 pounds next year, start with a single small change to a healthier diet each week. To add 20 pounds of muscle, start light with the 7 compound exercises and add 1 more rep to each set each week and add 1 new exercise a month. Even if you didn’t start to see any weight loss or muscle gain in the first 7 months, you’d still only need to drop 1 pound of fat or gain 1 pound of muscle per week from August on to still meet your goals for the year. Put another way, gaining or losing just 1/2 a pound a week throughout the year would be 26 pounds for the year – you’d have surpassed your goal by 30%. Getting and keeping a healthy lifestyle is a life-long pursuit, so remember that health, fitness and weight maintenance are marathons, not sprints. Sure, every woman at some point wants to be a size 0 and every guy wants to become a Herculean champion. But for most people that’s just not going to happen no matter what they do. We’re all born with pre-set genetics that, to one extent or another, predetermine what our ultimate limits are. But the good news is everyone can still do an awful lot to improve themselves before hitting those top limits – in fact, very few people, including pro athletes, never reach the point where they find out what their limits are. So set reasonable goals, based on where you’re at now. If you’re planning to lose weight, find out what your bodyfat levels are and plan to lose 10% or 25% of that over the year. Notice I didn’t say a percentage of your weight, but a percentage of your bodyfat. This is important because your body has a lot of weight it needs – muscles, organs, skeletal bones, blood, brain and the like. So for example if you have 30% bodyfat and you weigh 250 pounds, your fat weighs 75 pounds and your goal would be to lose 7.5 to 19 pounds over the year. 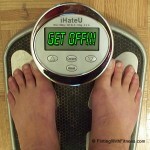 If you weigh 120 pounds with 30% bodyfat, your fat weighs 36 pounds and your goal would be to burn off 3.6 to 9 pounds. If you’re lifting weights to build muscle or build strength, the idea is even simpler. Don’t say ‘I want to gain X pounds of lean muscle’ or ‘I want to squat/deadlift/bench X pounds’. Instead, aim for the best gains you can safely and reasonably achieve. The best you can do with no drugs, proper form, strict lifting without using momentum, etc. To build the muscle, try to add 1 rep to each set each week while increasing the weight you’re using once a month. To build strength, add a bit more weight to each of your work sets any time you can while still maintaining proper form. Either way, don’t get hung up on the weight being used or drawn into comparisons with others – focus just on your personal progress as the year progresses. When one sets realistic goals to build muscles or lose weight and truly believes they can achieve and over-reach those goals it’s easier for them to stay on track. For others, though, it’s common for them to seek refuge in the ‘knowledge’ that they couldn’t reach their goals no matter what they did. How often have you heard someone say “I’ve tried everything and nothing works!”? The truth is NO ONE has tried EVERYTHING. Overcoming this one is tougher since your self-talk programs your subconscious, which in turn controls your urges and confidence. If you’re one of these people, find an accountability coach such as a weightloss coach or a personal trainer. Knowing they’ll give you a hard time if you miss a session, that they’ll be expecting you to show up and that you’ll be paying for their time whether you show up or not will greatly increase the chances you’ll stay on track. Another option is to find someone with similar goals to lose weight or build muscle and keep each other on track. You’ll still need some self-discipline to show up when they don’t – don’t use their actions as permission to slack off yourself! And be prepared to replace your partner, or add in another person, if you find they’re not as committed as you are – no one but YOU should be setting your pace or be in charge of your results. How are you doing with YOUR fitness goals and weightloss goals so far this year? 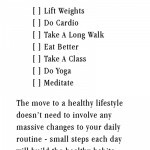 Did you makes New Year’s Resolutions regarding health and fitness? How are you doing with those goals so far? Let me know in the comments section below & I’ll answer any questions I can for you about your fitness, exercise, health and weight loss goals. This entry was posted in Fitness, Fitness Motivation, Weight Loss and tagged build muscle, fitness, fitness goals, health, lose weight, New Year's Resolutions, weight loss goals. Bookmark the permalink.